Wolf Challanger Commercial Range 34"
The Wolf Commercial line is not intended for residential installation. Commercial models have open pilot lights and are not insulated, thus cannot be placed beside combustible material. Free shipping on Wolf Equipment to commercial destinations with loading dock in the continental U.S.
Dvorson's offers the finest in restaurant supplies and kitchen appliances. 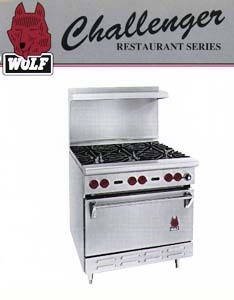 Contact us about this Wolf Special or any of the other 58,000 items we stock. To place your order you can Phone, Fax, or E-Mail with your Visa or Master Card, or mail us a check or money order. And we always accept cash at our store; come by we'd love to see you!